Designer Fashions at Great Prices. Material: Cotton Blend. Rise: Mid-Rise. Inseam: 28" - 29". Outerwear & Blazers. Apparel Size Chart. GoodItem has minor flaws, but no signs of significant use. Faint marks, loose threads, and/or slight discoloration may be visible upon detailed inspection. Leg opening is 5.5". across the front of the waistband is 14.5". the inseam is 28". Great Women’s pink Adriano Goldschmied jeans size 29R. Excellent condition. Made in the USA. Womans AG Adriano Goldschmied Jeans Legging Ankle Size 30R. Style: The Legging Ankle. Knit Luxe Denim - feels like soft leggings, not stiff at all. Materials: 38% Cotton, 33% Cupro, 21% Polyester, 8% Polyurethane. Adriano Goldschmied THE KISS / Ag-ed Denim Slim Straight Leg. Inseam: 33". Length: 42". Waist: 15". 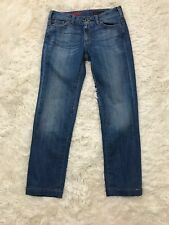 Adriano Goldschmied AG Jeans 'The Stevie Ankle' Slim Straight Light Blue Wash 32 R - Good condition. Only very light signs of wear. - 27" Inseam x 9" Rise x 16.5" Waist laying flat (un-stretched). See photos for fabric composition. Zipper Fly Closure. Our main focus is the resale ofauthentic designer clothing, shoes, handbags and accessories. Does not diminish the overall appearance of the item.Very Good - Well-maintained. Shows minor signs of wear that are consistent with light use.Good - Shows signs of regular use. Inseam: 32". 98% cotton, 2% elastane. AG Isabelle High-Rise Straight Crop Jeans. Light Pink. I have not worn yet. The Nikki Relaxed Skinny Ankle fading/whiskering/distressing. 33" inseam- 16" waist one side flat- 8" rise - 6" wide at ankle. The Stevie Ankle, Slim Straight Leg. High Rise. Classic 5 Pocket Styling. Olive Wash. Leg Opening - 6" (12"). Rise - 9 1/2". Marked as Size 32 R. I am always more than happy to make it right with you. Excellent used condition, see pics. 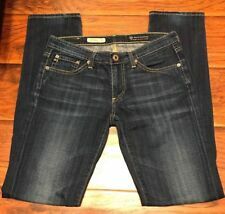 AG ADRIANO GOLDSCHMIED THE STEVIE SLIM STRAIGHT JEANS SIZE 28R (29x31) EUC MINT! AG ADRIANO GOLDSCHMIED THE STEVIE SLIM STRAIGHT JEANS SIZE 28R (29x31) BLUE 70% COTTON - 28% LYOCELL - 2% POLYURETHANE 5 POCKET - ZIPPER FLY MEASUREMENTS LAYING FLAT: WAIST: 29 INCHES FRONT RISE: 7.5 INCHES INSEAM: 31 INCHES LEG OPENING: 6.25 INCHES EXCELLENT MINT CONDITION!!! 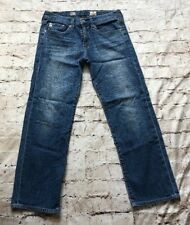 AG Adriano Goldschmied Jeans The Stevie Ankle 27R Slim Straight 4 a3 NICE!! AG Adriano Goldschmied Jeans The Stevie Ankle 27R. Stated Style (Add'l. Detail) : Slim Straight Ankle. ALL Pictures are of the actual item. Disregard contrast, creases, ripples and other variances of color within the pictures. Adriano Goldschmied The High Rise Stevie Ankle Slim Straight Jeans Size 26. Condition is Pre-owned. Actual Inseam: 28 " (From crotch to bottom of pant leg). Front Rise: 9 " (from crotch seam to top of waistband). Every piece I select I really love and hope you do as well. I'm working to provide beautiful clothing at super low prices compared to new. AG the Stevie Ankle cuffed, white, size 29. SML2468101214161823 in.24 in.25 in.26 in.27 in.28 in.29 in.30 in.31 in.32 in.33 in. 24P25 in.26 in.27 in.28 in.29 in.31 in.32 in. 23 in.26 in.27 in.29 in.30 in.32 in.